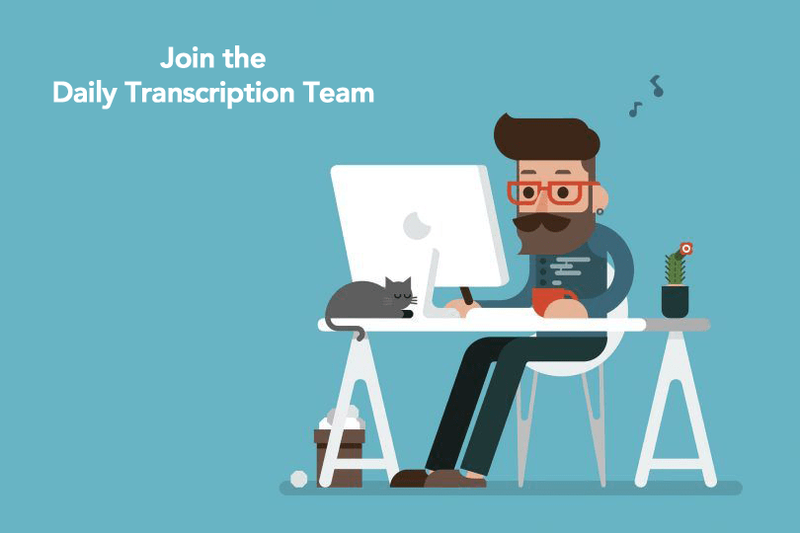 Interested in a transcription career? We’re excited that you’re interested in one of our openings! Daily Transcription provides services to entertainment, corporate, and legal industries as well as to academic institutions. Benefits of working with Daily Transcription. Flexibility; create your own schedule. Work where and whenever you want. Assignments come to you, Paid Weekly. We pay higher rates than our competitors: Rev, Transcribeme, Scribie and many more (starting rates at $0.75 -$0.85 per audio minute). Receive training, feedback, and coaching. Collaborate with like-minded others and learn from the best. Spend more time with family while you earn extra income for your household. We don’t guarantee a specific amount of work per day/week but our top transcriptionist makes anywhere from $250- $950 per week. Stay home mothers, fathers, students, part-time teachers, writers, academics or anyone who wants to supplement their income. You must be a highly detailed individual who is committed to perfection! Independent workers who can meet strict deadlines. Professional, novice, and beginners are welcome to apply. Click on the position you want to apply on the right side nav bar of this page. You will be expected to pass a Skills Assessment Test as well as an actual Transcription test. Check out the list of FAQs below for additional questions. Transcription is written or printed representation of audio into a document or text file. As a transcription freelancer at DT, you’ll be assigned work based on the amount time you sign up for on our scheduler. We’ll send you a notification via email when the audio/video files are ready for transcribing. Your job will be transcribing the files you are assigned once logged in the assignment directory folder. The media content, style, subject, pay rate, and the due date will all be listed upfront so you can decide if it’s a good fit for you or not. After submitting a completed job, you can update your schedule to reflect your availability. You will be paid out every week based on all the files you transcribed in the prior week. What experience or skills do I need? We welcome professionals, as well as, novice and beginners transcriptionists. You need to have typing skills of at least 50 wpm, excellent listening skills, a strong mastery of English, and the ability to meet strict deadlines. What equipment do I need to get started? You should have a dependable computer with internet. A transcription software such as Express Scribe (Free download) or otranscribe.com (online). A pair of good headphones. A foot pedal is not required but we highly recommend you have one (Infinity USB Foot pedal). Yes. We provide transcription training video, style guides, a procedure document, and as many practice jobs as you request. Also, constructive feedback from our many experienced transcriptionists after you complete a job or while you are working, feel free to ask our QC team any questions but we do ask you to carefully read through our Style Guides and take your time when you are learning. Your success is our success! Can I apply if I do not live in the US? To apply as a Transcriptionist you MUST reside within the United States or Canada. We will ONLY consider candidates outside the United States and Canada for Subtitling/Captioner and Translation who are proficient in a 2nd language. How do I get started with Daily Transcription? Click on the link above to the specific career that interests you. You will be taken to a career form. Complete the career form and upload your resume. You will be redirected to our Skills Assessment Test. When you pass the Skills Assessment Test, you will receive a link to the Transcription test for your area of expertise. Daily Transcription pays weekly by check only, unless you are outside of the U.S. or Canada, other payment arrangements can be made. Yes! You need to be 18 (eighteen) years of age or older. Does it cost money to apply at Daily Transcription? No! We have no fees to apply or to start working at DT. All of our transcribers, captioners, and translators are independent contractors. We do not withhold taxes from your earnings. When on-boarding you will be required to complete a W-9 or W-8 and you will receive a 1099 at the end of the year for tax purposes. Taxes are not taken from your check. Therefore, you are responsible for all your with-holdings at the end of the year. We cannot give you advice on how to handle your taxes. You should consult a tax accountant or contact the IRS or local state tax agency to see your responsibilities as a 1099 contractor.